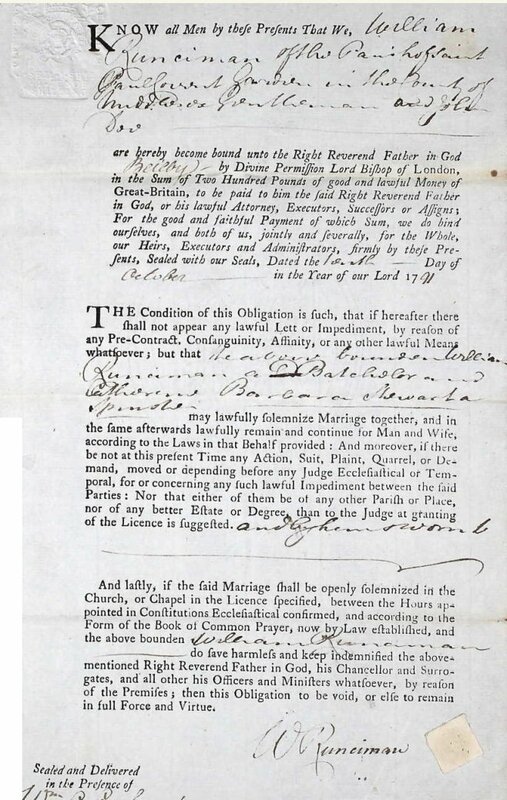 The Marriage Bond, 10th October, 1791. The Marriage Allegation, 10th November, 1791. 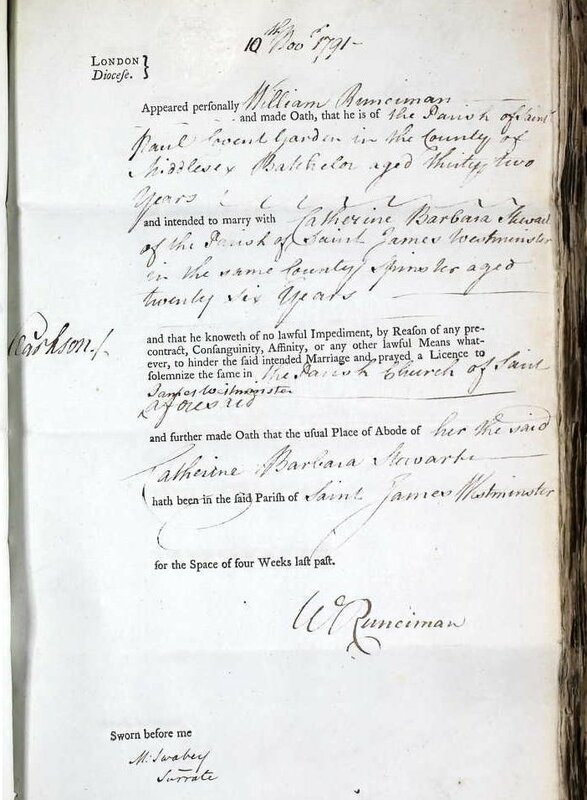 "William Runciman of the Parish of St Paul Covent Garden & Catherine Barbara Stewart of this Parish were married in this church by Licence from the Bishop of London this first day of December in the year 1791 By me Richard Hainsby Curate." "This marriage was Solemnized between us Wm Runciman Catherine Barbara Stewart In the presence of Jn Jes Le Jeune, Sophia Stewart, Cath Stewart"
"Boyds marriage index records the marriage as being at the Bavarian Embassy Chapel (RC), Westminster Their marriage allegation 10 Nov 1791 shows William as 'of the Parish of Saint Paul Covent Garden batchelor aged thirty two' and Catherine Barbara as 'of the Parish of Saint James Westminster in the same county aged twenty six years'"
William Runciman was a joint executor in Cosmas Stewart's will, drawn up in 1798. At that time Cosmas gave William's address as Chandos(?) Street, Covent Garden. When he updated his will in 1813, he altered William Runciman's address to Birchmore, Bedfordshire. (3 or 4 miles from the Duke of Bedford's Woburn Estate). William worked on the Woburn Estate. 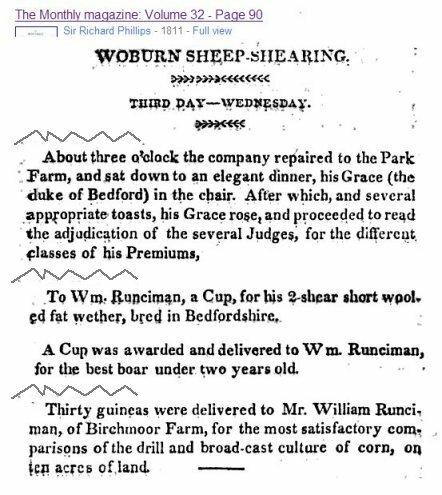 The Gentleman's magazine, Volume 88, records that William was a contender at the in the 'Woburn Sheep Shearing' in 1800. 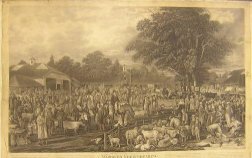 "Photograph of Woburn sheepshearing by George Garrard. Section of the print showing the Woburn shepherd in his smock frock and behind him to the right, William Runciman, one of the Duke of Bedford's tenant farmers." William seems to have been good at farming. The cutting on the right shows that he won a number of prizes in 1811. Thomas William Glanvill "was placed by his guardians to study farming under Mr William Runciman of Birchmore Bedfordshire." This was before 1820, since in that year, Glanvill married Cathe Moody Runciman, one of William's daughters. "What of exchanging him for Runciman's pupil?" William Runciman - Superintendent of works.". Runciman on care of woods , 16 foolscap pages. The notice of the creditors meeting, on the right, is from The Northampton Mercury, March, 1822. "As Mr Runciman, of Birchmore-house, near Woburn, was putting a gun into a bag, he shook it to get it in, and his man having been entrusted with it to shoot a dog, he had imprudently left it cocked, it went off, when the muzzle was close to his left foot, which was mangled in a most shocking manner. In this dreadful state he had the fortitude to ride to Woburn on horseback, to a surgeon, when he was obliged to undergo an amputation of the great toe and adjoining one. He is now in a fair way of doing well." 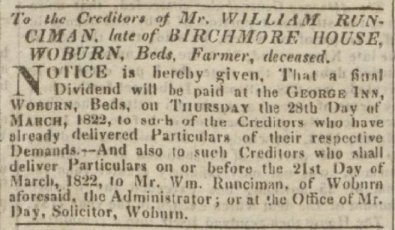 William obviously recovered as his death was 20 years later; Jackson's Oxford journal recording him as "an eminent agriculturalist, breeder, and grazier"
See Origins of the Runcie name for Runchman-Runciman connection.